Problem: You want to play a sound eg for anchoring or aversion purposes during a therapy session but you don't want to have to search for the sound file, and you want to play several different sounds on demand. You also dont want jarring increases in volume, you want the sound to gently fade up to normal volume. 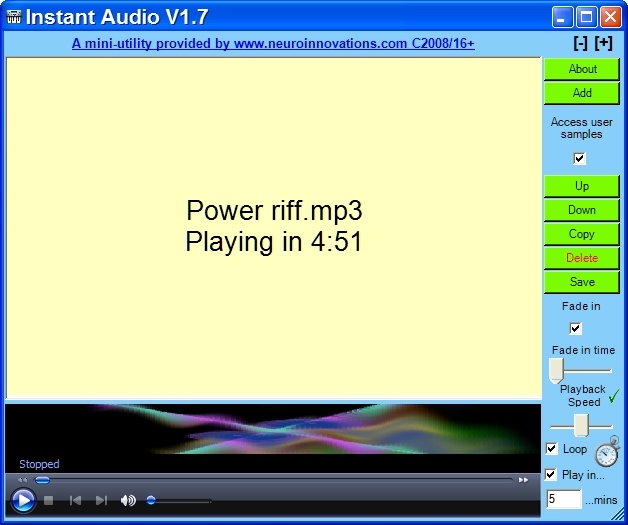 Solution: Instant Audio is a free media player designed for use by psychotherapists that want to play audio files instantly on demand during therapy sessions. The option to gently fade sounds in when first played is present. 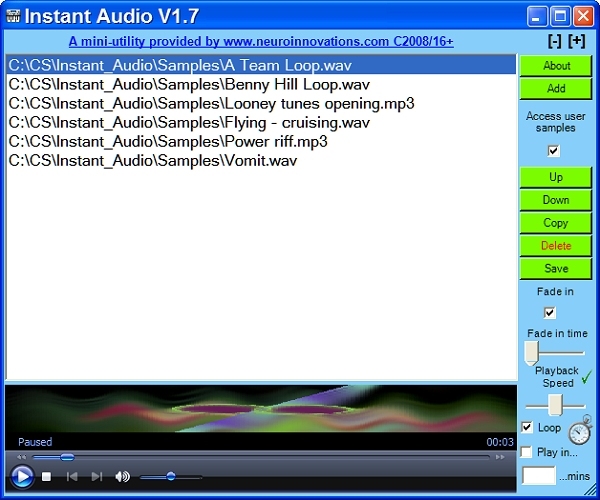 Several user audio files are provided in the installation and if EMDR Pro or the Therpaists Toolkit is installed you can access the shared media library very easily. A fade-in option is provided meaning that sound loops can be played without a jolt in the volume when first played. Slow down or speed-up the sound (if possible with the file being played). Sound files can be added one by one, or you can add many files at the same time. 19 files are displayed before needing to scroll down. You can reorder the files and have more than one copy of the same file. The file list can be saved and the list is reopened when the software is reopened. 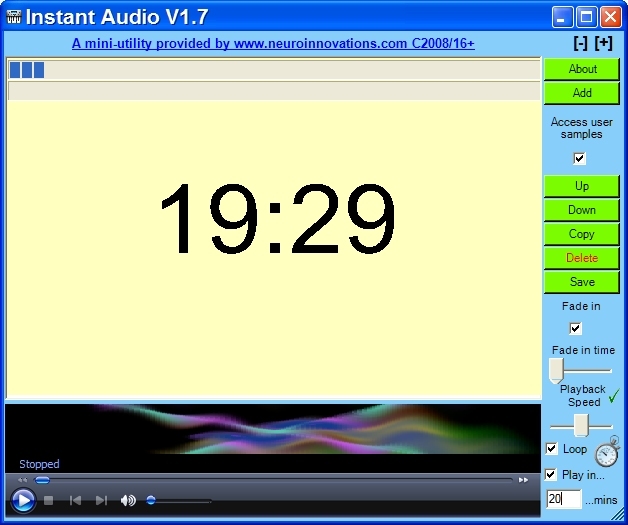 Play sound in x minutes (delayed playing). The software does support use on XP/Vista Netbooks. How do use Instant Audio? Instant Audio can be used as part of the process for treatment of trauma / PTSD, the treatment of panic attacks / agoraphobia, the treatment of phobias and fears, the ongoing management of stress and anxiety and the treatment of addictions and habits.